From September 1977: the very first 2000AD ANNUAL, from IPC's Fleetway imprint. Yup... that REALLY is Dan Dare on the cover! The galaxy's greatest comic always played fast-and-loose with the Pilot of the Future but this interpretation really demonstrates how far Tharg was willing to deviate from the established formula. The Fleetway annuals that accompanied most of IPC's weeklies (even the long-defunct ones) were assembled by a different team which allowed, by (bad) luck or (bad) judgement, the spin-offs to sometimes only enjoy a passing resemblance to the 'mothership'. A situation compounded by finite budgets (which meant that much dipping into the combined IPC vaults was required), key creators already committed to the remorseless weekly schedule of the core title and, in 2000AD's case, an annual that (because of extended lead times) had to be put together alongside the earliest regular issues. This was one of the two earliest spin-offs from the weekly: IPC also issued a DAN DARE POSTER MAGAZINE one-shot circa August '77. See here for more. 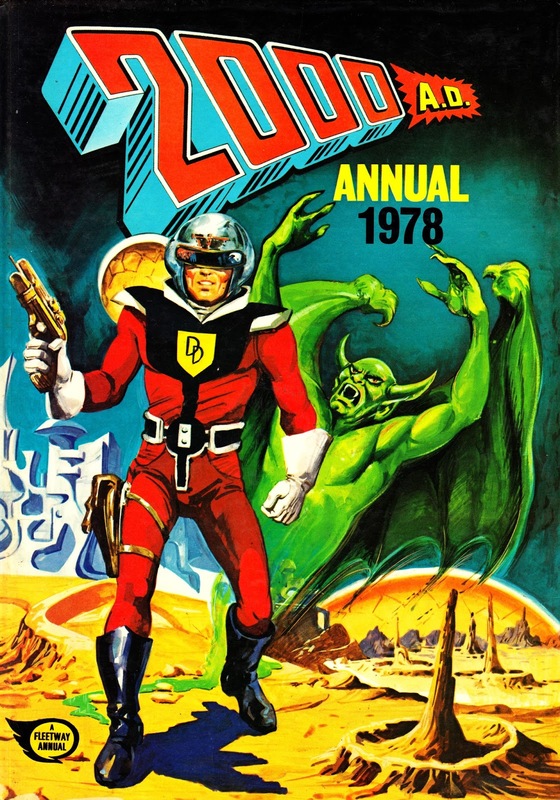 It total, 14 2000AD annuals appeared cover-dated between 1978 (published 1977) and 1991 (published 1990). Another four appeared as softcover "yearbooks" dated 1992 - 1995 (published 1991 - 1994 respectively). The sudden decline in the sector sealed the fate of what had been a sure thing throughout the Star Age. The following year (cover-dated 1979) Tharg added a DAN DARE ANNUAL to his hardback offering. Although still hindered by Fleetway's set-up, the spin-off was actually better than the core title. A second outing followed a year later before it became obvious that Dare, by now the subject of a possible TV adaptation and a mooted move to a revived EAGLE, was not going to become 2000AD's breakout character. The first JUDGE DREDD ANNUAL appeared in late 1980 with a 1981 cover date. A total of eleven were published with the late appearing in 1990. Four Yearbooks appeared between 1991 (cover-dated for the following year) and 1994 (for 1995). 1990 saw a concerted effort to elevate Rogue Trooper from the strip ensemble to make him the comic's next big star. Unfortunately, he failed to break out and the ROGUE TROOPER ANNUAL 1991 was the only one to appear.